General Motors introduced 4-wheel disc brakes with the 1965 Corvette, and started equipping other models in its various marques around the same time. While the original disc brakes were a head-and-shoulders improvement over the old drum-and-shoe stoppers, brake technology has continued to evolve and improve over the last 40 years. That means that you can have better stopping power on your collector vehicle without breaking the bank to achieve it. The project car is a 1969 Corvette big-block coupe with just a shade over 42K original miles on it. Due to age and rust, I opted to totally revamp the braking system by replacing the pads, calipers and rotors with the latest products available. I chose Mid America Motorworks as my parts source, and the bill of goods included O-ring stainless steel sleeved calipers, power-slotted rotors and semi-metallic brake pads all around. Ford and Mopar products of the mid-60s muscle car era used clips to hold the rotors on the hubs while the car was on the assembly line until the wheels and lugs secured them permanently. For some reason unbeknown to me, General Motors riveted the rotors on! So if you're going to be working on the disc brakes of a GM vehicle, be prepared to drill out 5 large rivets on each hub. In addition to a vacuum brake bleeder tool, you'll need a set of combination wrenches, air impact wrench & sockets, a flat-blade screwdriver, 3/8” drill bit (titanium recommended), electric drill, pry bar, line wrenches, 100-grit sandpaper, needle-nose pliers, dial caliper, orbital sander and a torque wrench. Here's a tip: use a catch basin or vacuum bleeder tool to contain the brake fluid as you bleed the system. Brake fluid will eat into the blacktop of your driveway or take the paint off your garage floor if it gets on it. Do one wheel at a time; this way, if you get confused, you still have one wheel intact for reference. You don't have to go the whole 9-yards to improve your stopping power; some folks may just opt to replace their pads, while others may want to use improved calipers and others will want to use better rotors than the stock unit. For that reason, I'm going to do this as a 3-stage project. In stage 1 we'll replace the brake pads only; in stage 2 we'll remove the rotors for resurfacing or replacement; and in stage 3 we will replace the calipers with new units. Replacing the disk brake pads is an easy task. 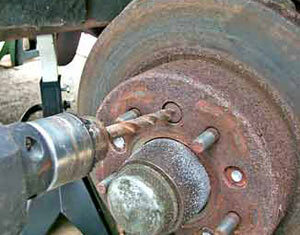 Jack up the car and support it with jack stands, then remove the lug nuts and take the wheel off. The brake pads are held on the caliper with a retaining rod. Use needle-nose pliers to remove the cotter pin on the end of the retaining rod, then pull the rod out of the caliper. With the retaining rod out of the caliper, the old disk pads can be lifted out easily using the needle-nose pliers. Now is the time to inspect the rotor for excessive wear, warping or grooves. If you don't have any grooving on the rotor you won't have to send it out to be “cut” or resurfaced. Use a dial caliper to measure the thickness of the rotor in several spots around its circumference. 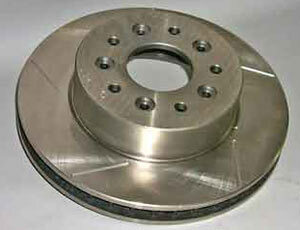 If you find a variance in the measurements of more than 0.005” the rotors are badly warped and must be replaced. The rotors must be thicker than 1.215” to be refinished. If they are less than 1.215” thick they must be replaced. If either of these conditions are present, see stage 2 for rotor removal. It is important to wash the rotor thoroughly with water and a good detergent to clean the surfaces on both sides. The reason for washing the rotor is to remove any residue or pad adhesive that was deposited on it from the old brake pads which could contaminate the new pads. Rinse the rotor thoroughly and dry it, then sand the surface lightly with a piece of 100-grit sandpaper to smooth the surface; an orbital sander works well for this job, since it gives the rotor a non-directional finish. Insert the new pads into the caliper (you may find that using a flat-blade screwdriver helps to retract the pistons) and secure them by inserting the retaining pin in the caliper, passing through the holes in the pads. Insert the cotter pin and bend it over. That completes replacing the pads on one wheel; remount the tire and tighten the lugs. Repeat the process for the other wheel(s) using the same procedures. Breaking in the new brake pads is the next item on the agenda. Proper break-in will assure you of great braking with no noise or squeal from the new pads, and this process is also known as “bedding in” the brakes. Go for a drive and get your speed up to about 35-40 miles an hour. Bring the car to a complete stop by applying gradual pressure to the pedal. Do this about 5 or 6 times. Accelerate up to about 40-45 miles an hour and bring the car to a complete stop using more aggressive pedal pressure, and repeat this about 5 or 6 times. Again accelerate to about 50-55 miles an hour and stop the car very aggressively 5 or 6 times. Your new pads will be well seated and bedded-in at this point and they should give you many thousands of miles of trouble-free service. Jack the car up and support it with jack stands, remove the lugs and wheel. The caliper is the next item to be removed, but you can leave the brake pads on the caliper. The caliper is held on with two bolts, and an air impact wrench with an impact socket is the ideal way to remove these bolts, since they are torqued-on at about 165 ft. lb. When the caliper retaining bolts are removed, the caliper can be lifted off the rotor. A piece of coat-hanger wire can be used to suspend the caliper to avoid putting strain on the brake hose attached to it. As I mentioned earlier, if your GM vehicle is still wearing its original rotors (as with the front wheels of the project car), they are held onto the hubs with rivets which have to be drilled out. A 3/8” drill bit (titanium bits are the best since they retain their sharpness longest) is used for this job. When all of the rivets have been drilled out, the rotor can be removed from the hub by using a pry bar around its circumference until it can be pulled free of the lugs. These can be a bit stubborn, but persistence will prevail in the long run. The rotor can now be sent out to the local automotive machine shop to be resurfaced or discarded if it is warped or below the specified 1.215” minimum thickness, or replaced with a high-performance rotor such as the power-slot rotors I used. A cut-off wheel can be used to remove the remaining stubs of the rivets from the hub; the rivets are not required to hold the rotor on, since the lug nuts will secure it adequately. Regardless of whether you are re-using your existing or re-surfaced rotor or installing a new one, it should be washed thoroughly to remove any residue or machining oil that may be on its surface. After rinsing and drying the rotor, 100-grit sandpaper mounted on an orbital sander is used to give the rotor a non-directional surface smoothing. Mount the rotor on the hub, then re-install the caliper (with a new rotor it's also a good idea to install new brake pads as well). Refer to your shop manual for the proper torque specification for the caliper mounting bolts and tighten them to that spec (165 ft. lb. for the project car), then replace the wheel and tighten the lug nuts. The same procedures are then performed for the opposite rotor. 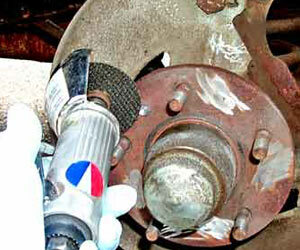 The first step in caliper removal and replacement is the evacuation of all the brake fluid in the system. A vacuum bleeder tool makes this easy to do if you're working alone. If you don't have a vacuum bleeder and you have a helper, open the bleeders on each wheel and have catch basins available to catch the fluid as it runs out. Have your helper pump the brake pedal until all the fluid is evacuated. Once the fluid is drained from the system, you can proceed with caliper removal. After removing the lug nuts and wheel, remove the two caliper retaining bolts. Then use a line wrench to remove the brake hose. You can use an open-end wrench, but you stand a much greater chance of rounding off the corners on the hose connector; a line wrench is a very worthwhile investment for this job, since a replacement brake hose or brake line will cost you much more than the price of the wrench. When the brake hose is disconnected from the caliper, the caliper can be removed from the car. Installing a replacement caliper is the opposite of removal: connect the brake hose line to the caliper, then mount the caliper and secure it with its two mounting bolts, torqueing them to the factory spec. 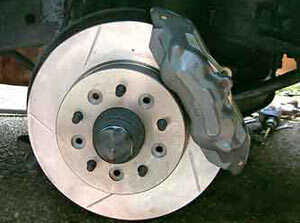 Install new brake pads in the caliper (see stage 1), remount the wheel and secure it with the lug nuts. Repeat these procedures for the other caliper(s) requiring replacement. When your new calipers are installed, you're ready to fill the system with brake fluid and bleed it to get any trapped air bubbles out. Again, a vacuum bleeder is the best tool for the job, although manually pumping the pedal will also purge the air from the fluid. When the fluid runs clear without any bubbles, tighten up the bleeder valves to close them. For bleeding the air from the system, work on one wheel at a time, with the other 3 bleeders closed. 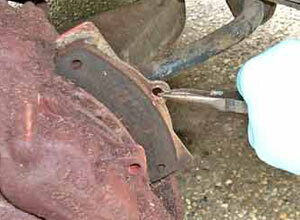 After removing the pad retainer pin, the old brakes can be lifted out using needle-nose pliers. These are the original factory rotors on this 1969 Corvette, held on with rivets. The rivets must be drilled out before the rotor can be removed. A 3/8 inch titanium bit works well for this purpose. An air-powered cutting wheel is then used to remove the remaining rivet studs. The rivets are no longer required to hold the rotor on, since the lug nuts will secure it. 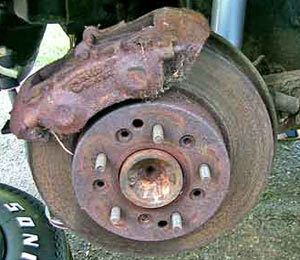 The rear rotors of this car had been replaced earlier, as evidenced by the absence of the factory rotor mounting rivets. Had they been original rotors, the rivets would have to be drilled out for rotor removal. 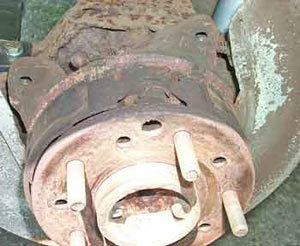 These rotors and calipers have seen better days, so they will be replaced with new units and new brake pads as well. When you remove the rear rotors on Corvettes and some other GM models from the '60s, you're in for a surprise - a brake within a brake. Inside the hub are miniature drum-brake shoes that expand against the inside of the rotor hub to function as the parking brake. Power-slot sport rotors and stainless-steel O-ring calipers with semi-metallic pads from Mid America Motorworks were used to give this 1969 Stingray superior stopping power. Here's the completed front wheel setup with a new rotor, caliper and brake pads. The procedures for the front and rear wheels are virtually identical.